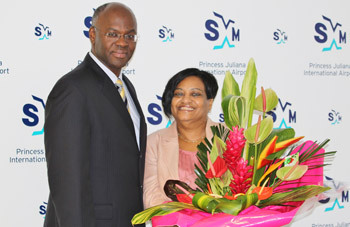 Holiday, who was president of SXM until he took office as the first Governor of an autonomous St. Maarten on October 10, 2010, was unable to attend the Anniversary Symposium, which was held earlier in the morning of December 3 at the Westin St. Maarten Resort and Spa. The keynote speaker at the conference, world-renowned aviation specialist, Dr. John Kasarda of the University of North Carolina, gave two thought-provoking master classes focused on the concepts of “airport city” and “aerotropolis.” Acting Governor, Reynold Groeneveldt, represented Governor Holiday at the Symposium. “Thus as the board, management and staff celebrate this milestone I wish you many more years of service and contributions by and for the people of St. Maarten,” the Governor concluded.